While these statistics got the headline attention they deserve, there is one piece of great news in the report that hasn’t attracted as much attention but is just as important. The gap between women’s and men’s earnings shrank to a new record low. The median woman working a full-time year-round job now earns 80 percent of the median earnings given to men working full-time. This is great news because as recently as 1981, the average woman in a full-time year-round job was earning less than 60 percent of her male counterpart. From 1960 to 1980, there was little change in the ratio of earnings. 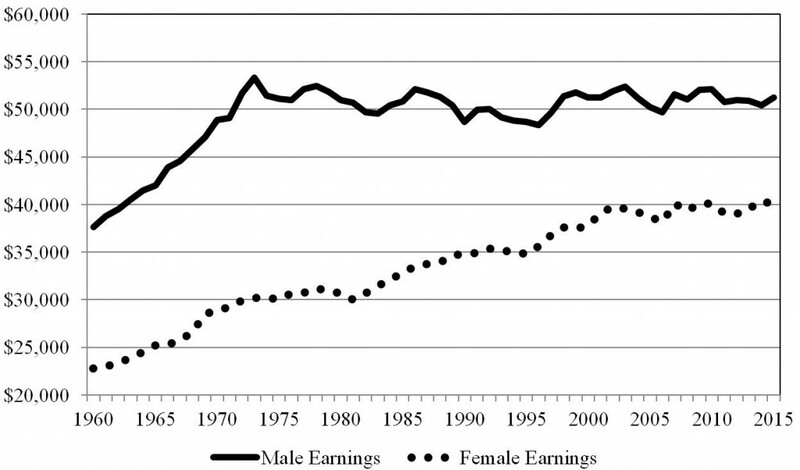 However, starting in 1980, the ratio of women’s earnings to men’s began to increase. Then in the early 2000s, the pay gap became stuck at 77 percent for a decade. The most recent data suggest the upward trend has resumed. Parity, where women earn the same as men, is a key government goal starting with the Equal Pay Act of 1963. 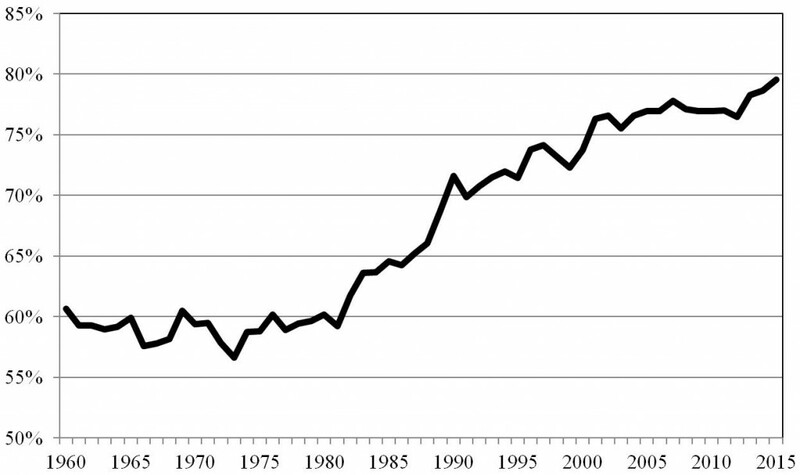 If the trend seen in the graph continues, the U.S. will reach parity in roughly 35 more years. Each year the Census Bureau releases a report on income and poverty in the U.S. These reports are formally known as the P60 series and are produced as a byproduct of gathering the nation’s monthly unemployment figures. The Census Bureau in conjunction with the Bureau of Labor Statistics interviews about 60,000 households each month to determine who is working and who is not. Once a year in March, respondents are asked additional questions about their before-tax income and earnings over the past calendar year. There are 18 categories of questions designed to get a full picture of the household’s income. For example, not only does the survey ask about wages, but it also asks about child support payments, social security and even educational assistance. The questions are fielded in the early spring to correspond with the April 15 IRS tax deadline. People should have their best understanding of their past year’s financial situation just around the time many fill out their tax forms. It should be noted, however, that there is a potential downside to the reduction in the wage gap if women’s gains are coming at the expense of men’s wages. The median earnings for full-time year-round male workers have not increased in decades after adjusting for inflation. Median earnings, the amount given to the person who is exactly halfway between the very best-paid full-time worker and the very worst-paid, tell a similar story. Median figures are better to use when comparing income because mean values are skewed by the small number of people with exceptionally high pay. Women have experienced a steady increase in their median full-time salary over time, growing from about US$23,000 in 1960 to $40,000 per year. Men saw their median earnings increase from about $37,000 per year in 1960 to over $53,000 in 1973. Since 1973, however, wages for men have stagnated, and the most recent value in 2015 was just $51,200, versus $47,200 for women. It is hard to determine from these data if the increase of women’s earnings is coming at the expense of men’s. This is because male earnings stagnated in the early 1970s, roughly a decade before the ratio of male to female earnings started changing. Pay parity is not here yet, even with the help of commercials featuring Batgirl highlighting the issue of unequal pay for equal work. However, the latest census report shows the country is on the road to parity and heading in the right direction. Posted by Jay Zagorsky at 11:52am Posted in Macroeconomics and tagged discrmination, earnings, females, males, pay parity, wage gap, wages. Bookmark the permalink. ← A common misperception about Labor Day is we all get the day off. Inspirational article and great news for all for making an efforts to narrow the gap between the male and female.